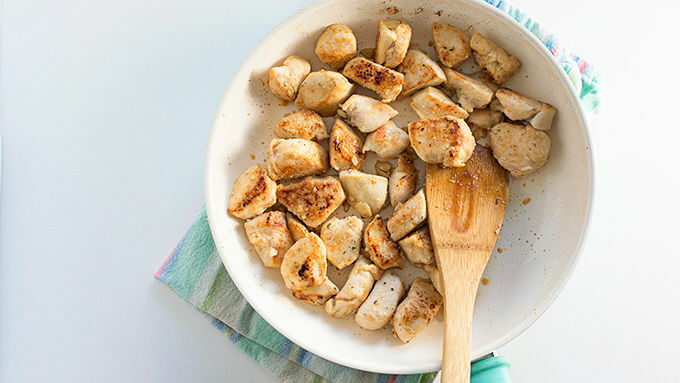 Toss the chicken breast with garlic powder, salt, and pepper. Heat olive oil in a 10-inch skillet over medium heat. Add chicken breast and cook until browned, stirring often, about 3 minutes. Add garlic to skillet and cook for 30 seconds more. Stir in rice and chicken broth. Bring to a boil, reduce to a simmer, and cover. Cook for 20 minutes, stirring occasionally. 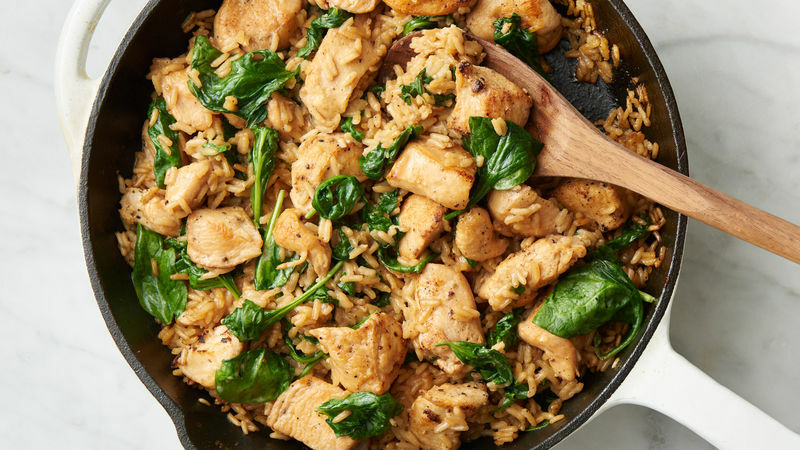 Remove pan from heat and place baby spinach on top of the rice. Cover and let sit for 5 minutes. Remove lid and stir well. Stir in cream and serve. Top with grated Parmesan cheese just before serving. Milk can be substituted for cream if desired. 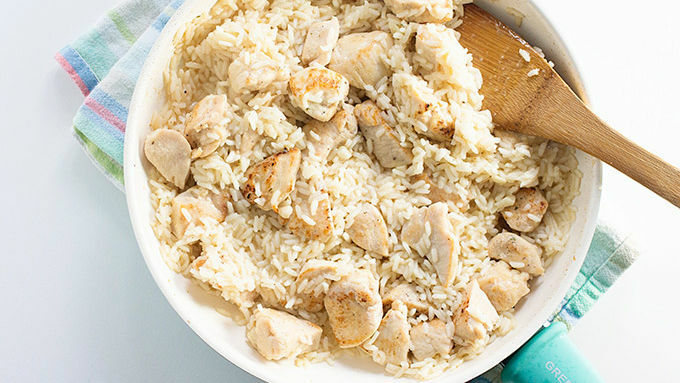 This chicken and rice dish is creamy and packed with garlic flavor. I love the little pops of bright green spinach scattered throughout! Let’s talk about washing the dishes. And how no one ever wants to be the one to do it. I mean, no. Dishpan hands? Not my thang. And I don’t even care that we have a dishwasher. I don’t want to load it or unload it or even think about dealing with it. I hate dealing with a messy kitchen, you guys! And I bet most of you do, too. So, let’s talk about getting dinner on the table with the least amount of mess possible. Let’s talk about a one-pot dinner. Life doesn’t have to revolve around dirty dishes, my friends. 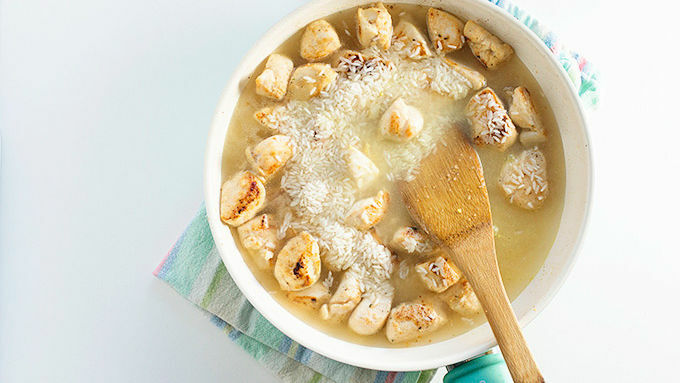 For this recipe, you’ll need some chicken, rice, lots of garlic, a little heavy cream, spinach, and some Progresso chicken broth. You’ll also want salt, pepper, garlic powder and a little olive oil. Cook everything in one pot and voila! 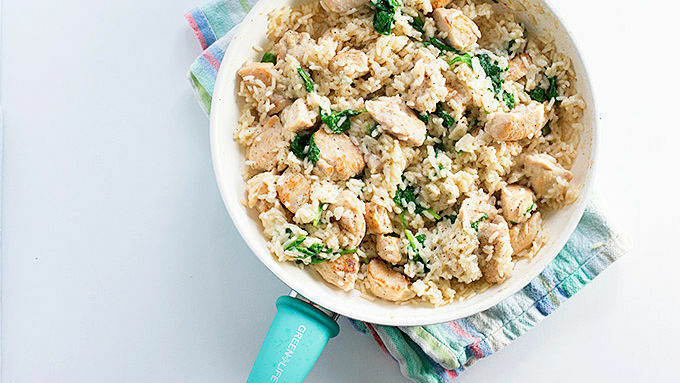 An easy, delicious dinner without the mess!